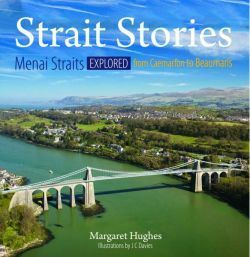 The Menai Strait, the narrow strip of water which divides Anglesey (Môn) from mainland Wales, is only twenty kilometres long, yet it boasts beautiful scenery. Many events of interest have happened here, and there have been some colourful characters. It is much more than a stretch of salty water: it is a timeline containing thousands of years of history. Prehistoric stones, Celtic hillforts and legends, Roman remains, Viking and Norman attacks, medieval castles and a wealth of maritime and industrial heritage are waiting to be discovered here. The strait is also crossed by two of the most remarkable and historic bridges found anywhere on the planet.